A species for full sun, Veltheimia capensis is from drier areas of South Africa. The flowers vary from a pale pink to a more rosy pink and the foliage has a blue hue to it. It will lose its foliage during its summer dormancy, however this is usually for only two to three months. As autumn comes around, the foliage reappears with the first rains. 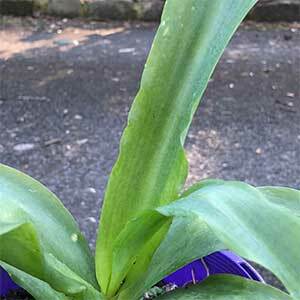 The foliage itself is more upright than that of Veltheimia bracteata, it also has undulating leaf margins which add to the appeal of the plant. This species needs to grow in full sun in order to flower, it also requires a well drained humus rich soil. This is another species also suited to growing in pots. After a few years the bulbs will multiply and can be divided, the best time to do this is in late summer. Seed can be collected from the pods that often appear after the flowers. Propagation is also possible from seed. Thee seed is best sown when fresh, sow it in trays in a seed raising mix covered by a thin layer of soil. Keep the trays in a shaded position with a little moisture. Germination should occur within 4 weeks. From seed to flower will take around 4 years. Flowers – Pale Pink to rosy pink although colour is variable.